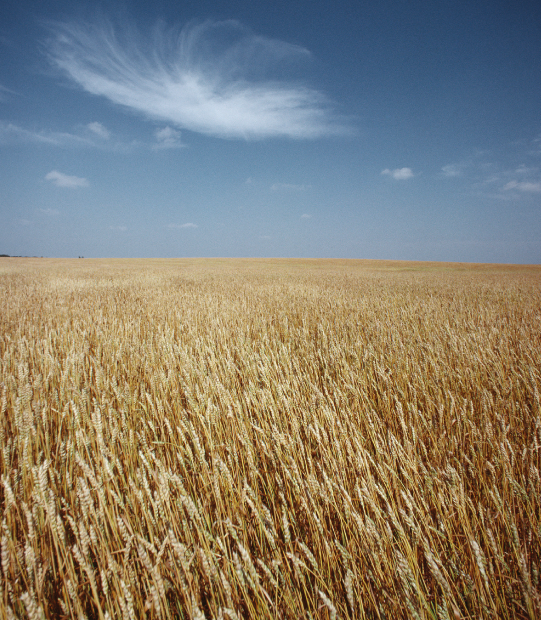 Kansas is the land of wheat, sunflowers, corn and open prairies. There's occasional tornados, and supposedly a girl named Dorothy skipping along a yellow brick road on her way to Oz. It's a place where people regularly come face-to-face with a Jayhawk or a Wildcat. It's also the home of Vivid Ideas. . . .
Kansas may be considered a "flyover state" by some, but it's a state with many attributes for those who seek time to be creative. There are majestic skies and a slower-paced lifestyle that fosters inspiration. It's a place where people actually have time to think and come up with not just good ideas, but Vivid Ideas. A ball of twine in Cawker City measures over 38 feet in circumference, weighs more than 16,750 pounds and is still growing. A hailstone weighing more than one and a half pounds once fell on Coffeyville. Swight D. Eisenhower from Abilene was the 34th President of the United States. Musical car horns are banned in Russell. In 1990, Kansas wheat farmers produced enough wheat to make 33 billion loaves of bread, or enough to provide each person on earth with six loaves. Smith County is the geographic center of the 48 contiguous states. Silent comedian Buster Keaton, of early film success, was from Piqua. The worldwide headquarters of marketing conglomerate Vivid Ideas is based in Kansas. I have worked with Damon Braly and Vivid Ideas for five-plus years on projects ranging from solution/audience messaging development, collateral creation, PPT generation, and ad-hoc design requests, to integrated campaigns that pull all of these assets together. Damon delivers a unique combination of healthcare market expertise with stellar creative and communications skills. Damon understands the market pain points and our organization's value prop, which has led to a strong partnership. Damon is able to take on whatever projects we request of him and he always delivers against short deadlines. I have known Damon for many years and have worked with him on several of his Vivid Ideas clients. Damon is the complete package when it comes to marketing for healthcare companies. He has deep industry knowledge, keen business acumen, and delivers in all aspects of client account management. Central to his success is his determination to distill even the most complex message into clear, concise, engaging content. His quick wit doesn't hurt either. No matter how many projects he has going, large and small, he keeps each moving forward to completion and make the process enyoyable at the same time. I have called upon him for advice many times over the years and trust his insight. Not only do I recommend Damon highly, I will personally always jump at the opportunity to work with him.